Radio Shack has added a second full-featured daisy wheel printer to its TRS-80 computer product line. The new DWP-410 (26-1250) is available for $1495 at Radio Shack Computer Centers and participating Radio Shack stores and dealers. 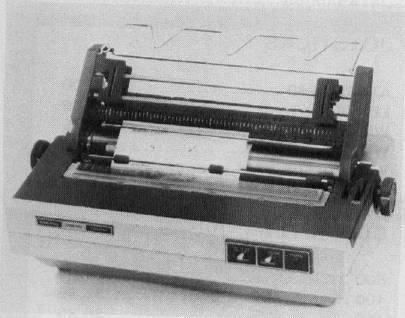 Radio Shack's daisy wheel printer. The DWP-410 prints executive-quality correspondence and reports at over 300 words per minute. It features selectable pitch – either 10 or 12 characters per inch – or proportional spacing. Interchangeable 124-character print wheels provide easy type-face selection. External Program Mode allows the use of print wheels with different pitch or special characters. The DWP-410 also features forward and reverse full and half line paper feed, underline, and programmable backspace, plus 1/120-inch minimum space and 1/48-inch line feed. Automatic Paper Set makes paper insertion easy and precise. The DWP-410 Daisy Wheel Printer is U.L. listed, includes a standard parallel interface, and comes complete with print wheel and carbon ribbon cartridge.